It gets difficult talking about no. poles and throws with stereo switched sockets, as three of the inputs are from the stereo plug itself. So I've drawn up a quick sketch showing how the switched socket works. The Jaycar part number I listed (PS-0133) does have a nice bezel, but wasn't available when I bought mine. It is slightly bigger, but I think it would still fit into the location I put mine. That's what I'll be buying once they have them in stock again, and at $1.00 they're dirt cheap! oh I see so they switch when you insert the plug..ahhh very clever!! Man you have done the yards on this!! Yup, I have done a bit of work, because I found it really annoying that ten years after the car was made, there's still no other simple guide that I could find to doing this very easy and useful mod!!! Yep, only ever seen surface mounted ones of those. The only other option i guess is to have a small patch lead? But then i guess that would act as though it was switched all the time would it? Does it switch mechanically or by detecting a signal? so in theory could you do this for any head unit with a stacker? It switches mechanically. The Jaycar one I showed the link to is a PCB mount, but this shouldn't be a problem as it has the front bezel which means it can be chassis mounted. In theory you probably could do this for any head unit with a stacker, but you would need to chase down the pin configs yourself to work out which wires to cut into. The exception here would be if some stackers sent the signal as a digital stream to the head unit and then the head unit decoded it, but I wouldn't imagine manufacturer's taking this path??? Can it be done for the mid-series stereo system? Also, can you run more speaker wires into the factory looms and put more speaker elements on the rear shelf, or tweeters mounted in the top of the front door? Instant Karma is gonna get you! This is great; makes me miss my old Premo Sound HU lol. Was a good unit, and with AUX input, ud be laughing. Great work, tech doco on the way i hope. BF Typhoon, Dejavu - 6sp Auto, Leather, Sunroof, 19"s, Electric Pedals, Tint, FPV Sports Wheel, FPV Mats. camh1980 ... such a mod may be possible for the mid-series stereo system if it includes a boot-mounted stacker. You would have to do it all from scratch though as I don't have any details on the pin config for a mid-series (no DSP) where the stacker plugs into the head unit. If you have a stacker with a plug that looks the same as I have shown, though, this would make things significantly easier. 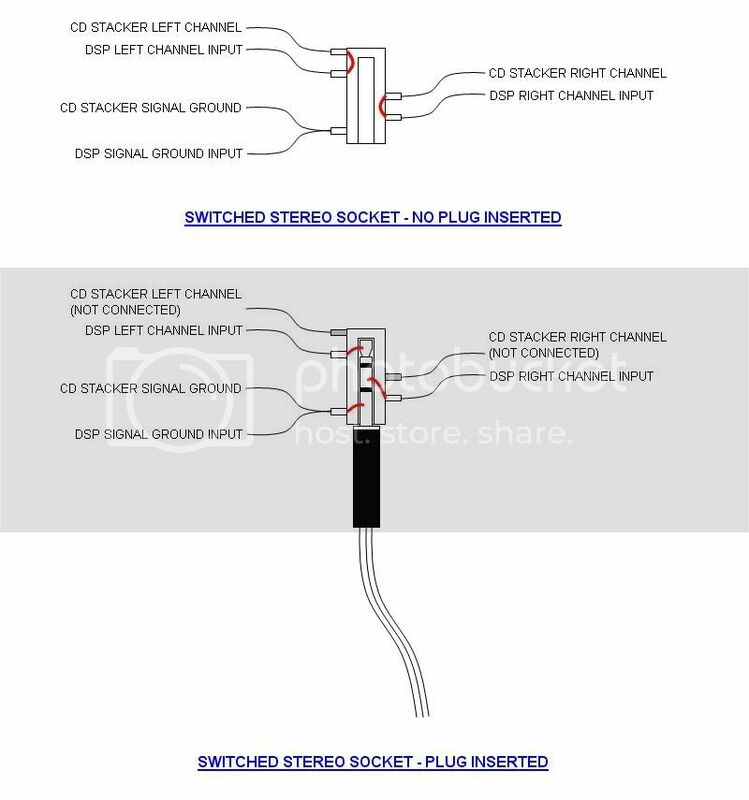 What you would have to do is to remove the HU and work out which plug has the same number of wires and same colour scheme as those leading to the plug that connects to the stacker. If you could isolate what you *thought* were the same wires at the HU end, then it would be simple to use a multimeter to check continuity between the pins at each end, confirming that you had the right wires. As soon as you had located the right channel, left channel and signal ground wires, then the rest of the mod would be as per my description. would using the switched C**k fix this problem? mitch_anderson, I'm not sure whether you mean that (1) for a set volume control position on the HU, the CD stacker is louder than the MP3 player; or (2) when listening to CDs via the stacker but with the MP3 player plugged in and switched off, the CD volume is very quiet. In answer to point (1), don't forget that the stacker outputs at a set volume level, whereas your MP3 player headphone jack is variable level. I set my MP3 player at full volume, and this gives similar volume to the stacker. For example, if you had a test CD that played one note at a constant volume, and tried playing it via the stacker and then from your MP3 player, the stacker would output a set 'reference' voltage that corresponded to that volume, and the deck would then amplify it. If this reference voltage was (say) 4V, but then your MP3 player outputs the same note at 3V, then the MP3 player would be noticeably quieter. On my MP3 player I am able to use the volume control to get the MP3 player output voltage very similar to the stacker 'reference' voltage, but this is MP3 player dependant. Hope this answers your question! Either way, the switched socket is by far the most elegant and complete solution. d**k have these ones... same thing? and also how to get to the dam stereo.